We spent a wonderful few days in Melbourne visiting Tamsin and John and experiencing some of the amazing productions that were part of the Festival. Transe Express opened the festival and although the night was cold the free event was well attended and quite spectacular. The London Philharmonic Orchestra was SUPERB and the Hamer Hall was the perfect venue offering excellent views so that the orchestra could be seen as a living organism , working in perfect unison and harmony. 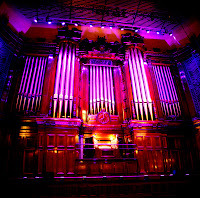 The surprise event was Cameron Carpenter's performance on the Melbourne Town Hall's amazing traditional organ......... the Town Hall R O C K E D that night !! !